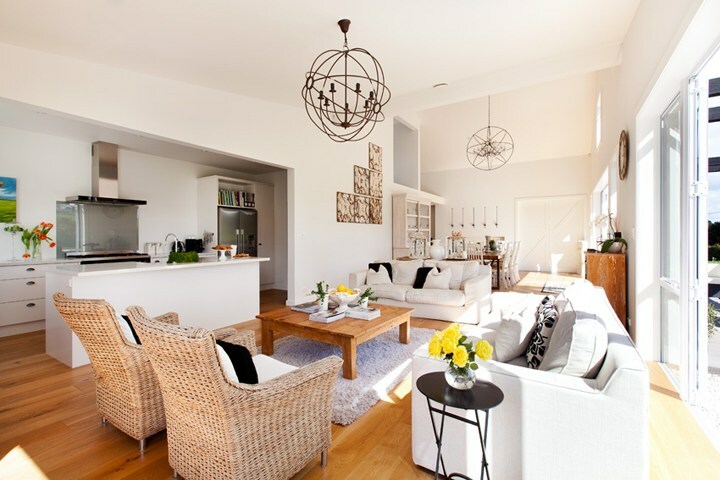 Sleek yet cosy, minimal in structure but rich in colour and texture, this striking country home is a comfortable family residence that makes a serious statement. From the multiple courtyards to the see-through gas fireplace that links the living and dining areas, this is a home with a firm commitment to flowing, timeless beauty. 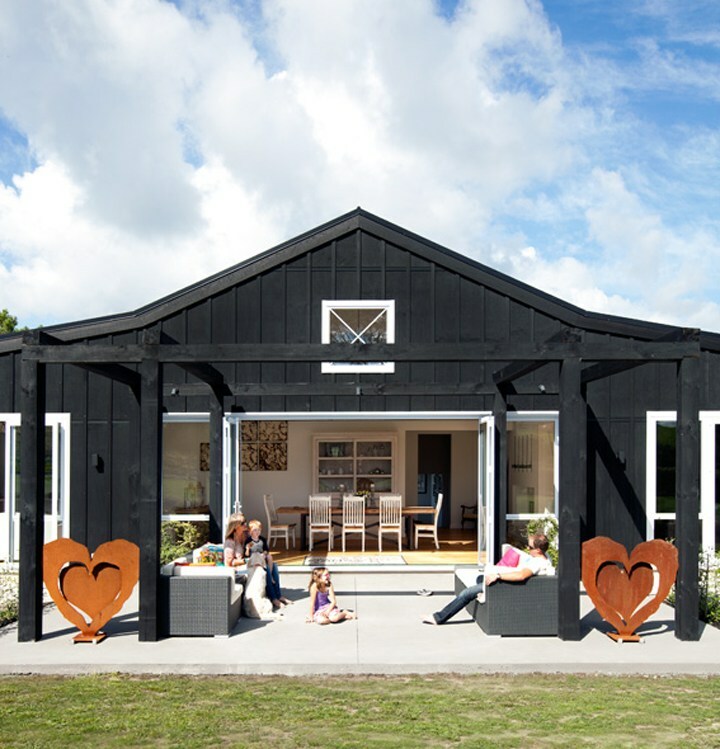 The open-plan kitchen and living area features a spacious galley kitchen, a chic play on the barn theme. Chrome kitchen fittings and a sleek ceramic butler’s sink add a sprinkling of modernity, while all-white kitchen surfaces epitomise the home’s signature freshness. Venture into the lounge area and the cushioned rattan armchairs, squashy white couches and solid wood coffee table make it clear that this is a living space unwilling to compromise on comfort. Perhaps the best example of the home’s seamless integration of the natural landscape surrounding it with modern conveniences is the dining room, which features a rustic solid-wood dining table and opens out onto a grassy terrace. The indoor-outdoor flow of the room is further enhanced by an Escea DX1500 gas fireplace. 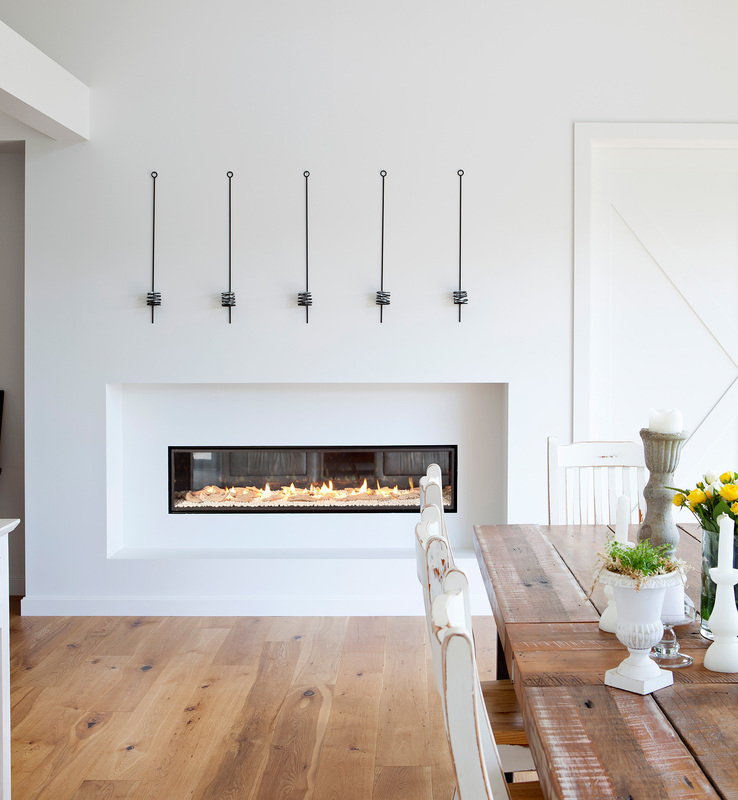 This frameless inbuilt gas heater is the perfect complement to the home’s modern-yet-rustic styling – the minimal exterior styling incorporates seamlessly into the wall, while the flickering flames add an earthy, rustic element. The juxtaposition of wooden and metallic textures that characterises the home is echoed within the fire’s White Crystalight flue bed with driftwood. Like the house itself, the designer fire is quite literally warm yet sleek – the DX1500 has a heat output over 10kw, which is dispersed throughout the house through a series of ducts, making it the ultimate beautiful heating solution. Fittingly for a home that is one with its natural setting, the DX1500 was recently rated the most efficient fireplace of its kind in Europe. Explore the warm, beautiful world of DX Series gas fireplaces. For more inspiration visit our blog about A modern retro house build with Escea gas fireplace.